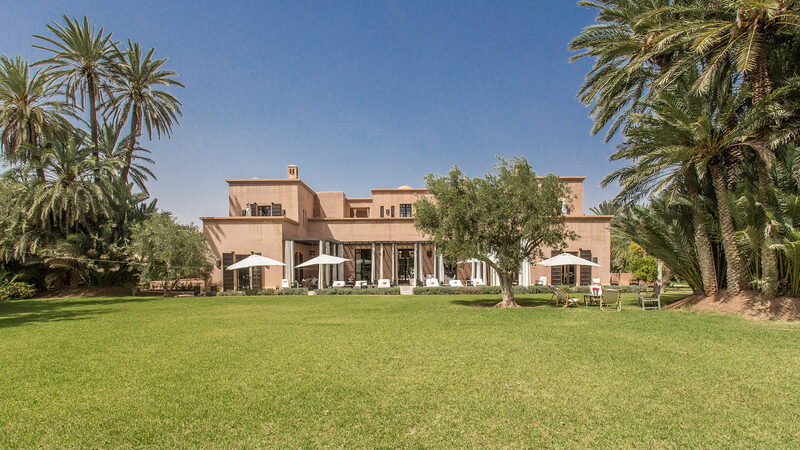 Luxury villa in Marrakech Palmeraie offering 8 bedroom suites, heated pool, private spa and gym, private tennis and staff. Beautiful private garden. 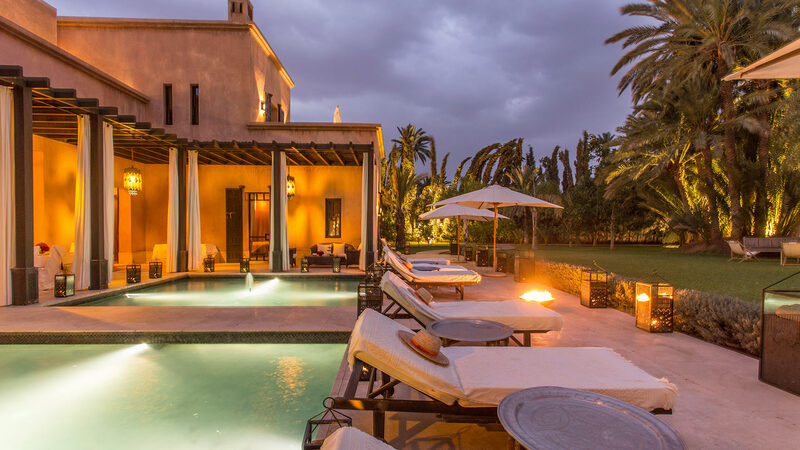 El Jenna is a luxurious villa located in the heart of a sumptuous garden in the Palmeraie of Marrakech. 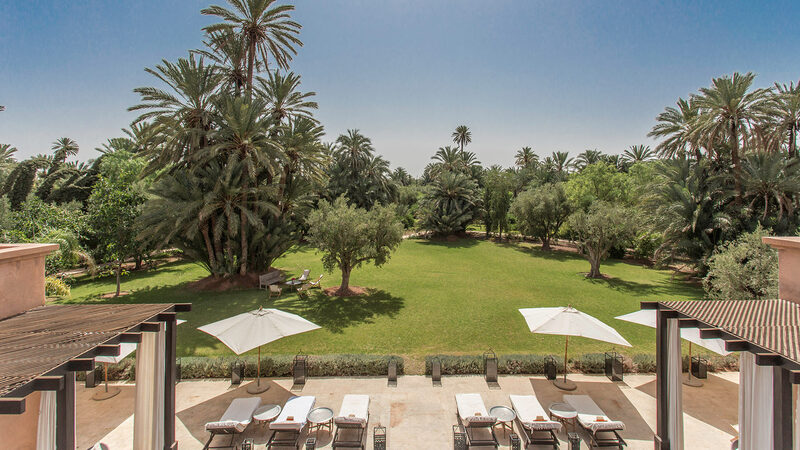 The property is 15 minutes from downtown Marrakech. The villa has 8 beautiful suites, 1 extra ensuite double bedroom and 1 ensuite bedroom accommodating up to 6 children. The villa offers a wealth of facilities: Tennis, private spa, cinema room, heated pool and skilled house staff that guarantees a stay and exceptional cuisine. The villa has 4 bedrooms on the ground floor and 4 bedrooms upstairs. Each room is very large, comparable to a hotel suite with private bathroom, shower and bath. The bathrooms are particularly large and neat and very well decorated. 2 additional bedrooms are available on the lower level where the spa and cinema are located. These bedrooms open onto a large, bright courtyard. Suite, Garden level, direct access to the garden, direct access to the terrace, view of the garden. This bedroom has 1 double bed 160 cm. Bathroom ensuite, With 2 washbasins, bathtub, walk-in shower, separate shower. WC in the bathroom. This bedroom includes also air conditioning, fireplace. Suite, Garden level, direct access to the garden, direct access to the terrace. This bedroom has 1 double bed 180 cm four poster bed. Bathroom ensuite, With 2 washbasins, bathtub, walk-in shower, separate shower. WC in the bathroom, separate WC room. This bedroom includes also air conditioning, fireplace. Room, 1st floor, direct access to the terrace, view of the garden. This bedroom has 1 double bed King size. Bathroom ensuite, With 2 washbasins, bathtub, walk-in shower, separate shower. WC in the bathroom, separate WC room. This bedroom includes also air conditioning, fireplace, private terrace. Room, Garden level, direct access to the garden, direct access to the terrace, view of the garden. This bedroom has 1 double bed King size. Bathroom ensuite, private, With 2 washbasins, bathtub, walk-in shower, separate shower. WC in the bathroom, separate WC room. This bedroom includes also air conditioning, fireplace. Room, Garden level, direct access to the garden, direct access to the terrace, view of the garden. This bedroom has 1 double bed King size. Bathroom ensuite, With 2 washbasins, bathtub, walk-in shower. WC in the bathroom, separate WC room. This bedroom includes also air conditioning, fireplace. Room, 1st floor, direct access to the terrace, view of the garden. This bedroom has 1 double bed King size. Bathroom ensuite, With bathtub, walk-in shower, separate shower. WC in the bathroom, separate WC room. This bedroom includes also air conditioning, fireplace, private terrace. Room, Garden level, direct access to the garden, direct access to the terrace, view of the garden. This bedroom has 1 double bed King size. Bathroom ensuite, With 2 washbasins, bathtub, walk-in shower, separate shower. WC in the bathroom, separate WC room. This bedroom includes also air conditioning, fireplace, private terrace. Room, Lower floor, direct access to the courtyard. This bedroom has 1 double bed King size four poster bed. Bathroom ensuite, With bathtub with shower head. WC in the bathroom. This bedroom includes also air conditioning. Children bedroom, Lower floor, direct access to the courtyard. The bedroom has 5 Beds including 4 single bed 80 cm, 1 double bed King size. Bathroom ensuite, With 2 washbasins, walk-in shower. WC in the bathroom. This bedroom includes also air conditioning. El Jenna is organized around a central courtyard in a typically oriental atmosphere. The tree-filled patio is an ideal haven for lunch or breakfast. The patio gives access to the various living rooms and the Moroccan dining room that can accommodate up to 20 people on two round tables. The main living room is a high ceiling room with a fireplace opening onto a very large terrace with deckchairs and parasols, an outdoor dining area and seating areas for a drink. The house also has a small game room and a secluded courtyard with a long Moorish pool where it is pleasant to relax. On the lower floor of the villa we offer a cinema room, a private spa with hammam, whirlpool and massage room as well as a gym. On this lower floor are also the staff rooms and a professional kitchen. 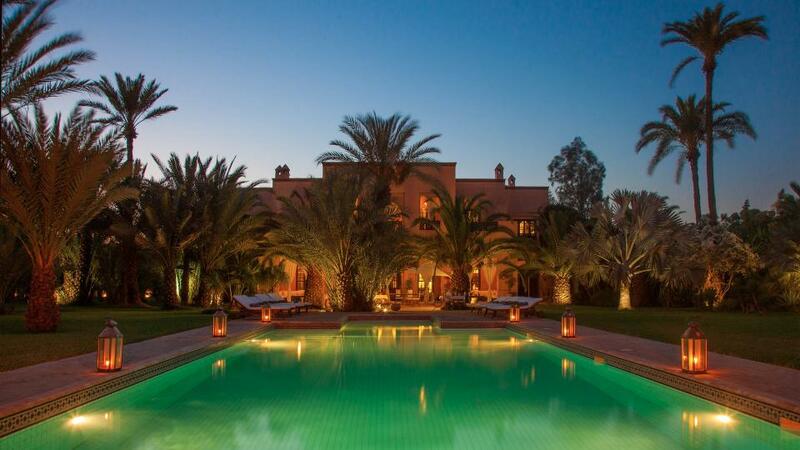 The villa is in the heart of a huge park of several hectares covered with palms, citrus and olive trees. A vast lawn separates the villa from the swimming pool at the edge of which is a pool house (shower and toilet). The pool is heated on request. Two horse boxes are placed at the entrance of the property. A tennis court is proposed behind the villa. 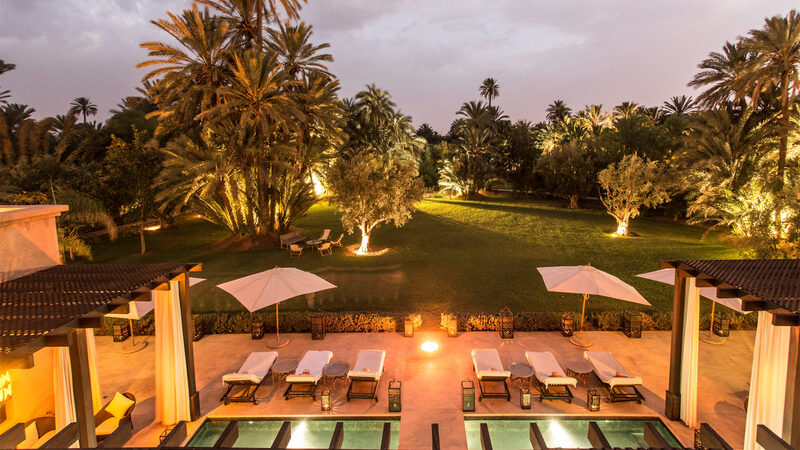 El Jenna is in the heart of the Palmeraie of Marrakech. This area is very quiet and beautiful and the few neighboring villas do not disturb the tranquility of the place. The golf courses of Palmeraie and Amelkis / Royal Golf and Al Maaden are each about 15 minutes drive from the villa. The city center is also 15 minutes away. A discreet and efficient staff is responsible for the maintenance of the house, the daily cleaning and guest service. 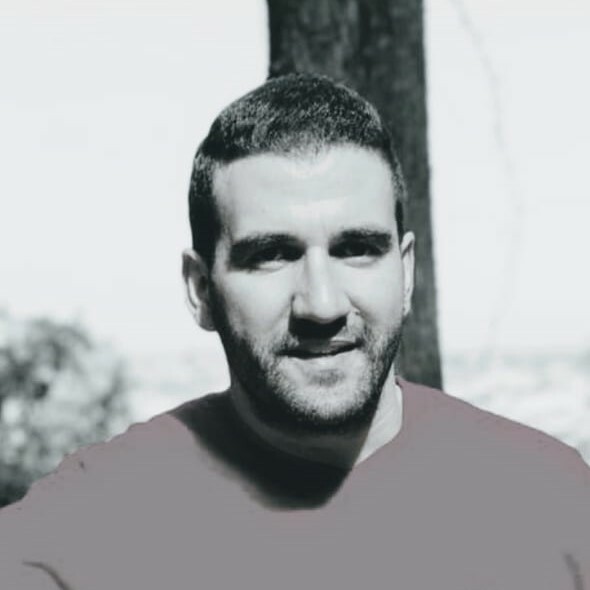 A chef will prepare you an excellent Moroccan cuisine. Traditional massage and hammam scrubing is available at the villa spa upon advanced reservation. Our concierge service in Marrakech will help you organize every detail of your stay. - The house chef/cook prepares all meals. Meals and beverages will be charged to your final bill.